The late Robert Ciro Gigante, whose radio pseudonym was "Bob Grant," was an anti-clerical, pro-abortion, quasi-libertarian, wholly-owned subsidiary of the Israeli Lobby radio talk show host from 1964, starting in California, until July 28, 2013, five months, three days before he died at the age of eighty-four on Tuesday, December 31, 2013, the Feast of Pope Saint Sylvester I. The late "Bob Grant" did, however, have a number of phrases that New Yorkers who listened to him picked up and made part of their own vocabulary ("Get off my phone, you jerk! ", " Let's be heard! ", "Straight ahead," "He folded like a cheap camera," "[Insert name of politician] is a fake, phony, fraud." Gigante, though, would use his own Freemasonic father's native Italian language now and again when it suited him to do so, including his frequent references to the man who was Governor of the State of New York from January 1, 1983, to December 31, 1994, Mario Matthew Cuomo, as "the Sfachim," "the low life:"
"Mario azende me tuzeprovenos sfachim." Translation: "Mario listen to me you are a low life." Well, Figlio di Sfachim (Son of the Low Life), has proven himself to be even more of a thug than his thuggish father, the Sfachim himself, a man who was noted to telephone priests and presbyters in the conciliar structures back in the 1980s if he, Mario Matthew Cuomo, heard from a supporter of his that he had been criticized from the pulpit for his support of the "legal right" of women to kill their preborn children. One priest, the pastor of Holy Family Church in Hicksville, New York, hung up the phone on Cuomo when the latter telephoned to register his protest with the pastor's criticism. Cuomo was also very miffed when the then "Archbishop" John Joseph O'Connor refused to acknowledge Cuomo's presence from the pulpit at the Cathedral of Saint Patrick in the Borough of Manhattan, City of New York, New York, during O'Connor's "installation" service on Monday, March 19, 1984, the Feast of Saint Joseph, even though the non-prelate acknowledged the presence of City of New York Mayor Edward Irving Koch, City of Scranton, Pennsylvania Mayor James Barrett McNulty, United States Senator Daniel Patrick Moynihan (D-New York) and United States Ambassador to the Holy See, William Wilson. I know. I was there, dressed in a cassock and surplice as a seminarian from Holy Apostles Seminary (how a group of us from Holy Apostles managed to get into the service is a story in and of itself as we had no tickets and most of the group had no official sponsorship to study for a particular diocese or religious community), watching as the red-faced Cuomo stormed passed me on the right transept of the Cathedral of Saint Patrick after the end of the joke-fest that was O'Connor's Protestant and Judeo-Masonic Novus Ordo "installation" service. (O'Connor was telling so many jokes at various points during the service that the late Father Vincent Miceli told me, "He's a comedian. He thinks he's Johnny Carson.") Cuomo never forgot that snub. Never. Although Figlio di Sfachim tried to walk back his comments in an open letter to the New York Post on Sunday, January 19, 2014, the Second Sunday after the Epiphany and the Commemoration of Saints Marius and his Companions and the Commemoration of Saint Canute, King of Denmark, the quotation above came from the Albany Times-Union newspaper website, not from the New York Post, and represented a direct quotation of his remarks. Although Andrew Mark Cuomo was discussing the plight of the Republican Party in the State of New York and in Washington, District of Columbia, the remarks he made on Friday, January 17, 2014, the Feast of Saint Antony of the Desert, clearly state his desire for all pro-life New Yorkers to leave the state. Try as he might, there is no way for Figlio di Sfachim to walk those comments back. (A separate article will be written concerning Figlio di Sfachim's desire to appeal to "moderate" Republicans, such as my former adversary for the United States Senatorial nomination of the Right to Life Party of the State of New York, former United States Senator Alfonse M. D'Amato, who has endorsed Cuomo the Lesser's bid for re-election. The temptation is strong to point out in great detail that all of my comments about D'Amato sixteen years ago were entirely correct; however, I will save that for the separate commentary). As I noted a few years ago now about the disgraced former United States Representative Anthony Wiener (D-New York), Caligula's Got Nothing On This Crowd. Modernity is burning, and the lords of conciliarism continue to add fuel to the fire, continuing to enable supports of willful murder and the sin of Sodom because they are allegedly "for the poor." It has been forty years now since a thirty-two year-old attorney from Queens, New York, received the designation at the New York State Democratic Party Convention for the office of lieutenant governor. The attorney's name was Mario Matthew Cuomo, whose eldest son, Andrew Mark Cuomo, had just turned seventeen years of age. The elder Cuomo, whose legal offices were located on Court Street in Brooklyn, New York, had been noted for the stirring lectures that he gave against the decriminalization of abortion whenever he was called upon by officials the Diocese of Brooklyn to speak to various parish organizations and other groups as its official representative. The Democratic Party designee for the office of lieutenant governor, however, faced a challenge from New York State Assemblyman Antonio Olivieri and State Senator Mary Anne Krupsak, a pro-abortion Catholic who wound up winning the primary handily on September 10, 1974. Believe it or not, Mario Matthew Cuomo said in a debate held with his challengers in Albany, New York, on August 25, 1974, that he would have voted against the 1970 bill that decriminalized surgical baby-killing in the first trimester of life in the State of New York if he had been a member of the New York State Legislature at that time. Defeated in his bid to be the Democrat Party lieutenant governor nominee in 1974, Cuomo learned to parrot the line that had been mastered by his political mentor, then United States Representative Hugh Leo Carey, who was elected as Governor of the State of New York on Tuesday, November 5, 1974, and served two terms, that he was "personally opposed to abortion, but would never impose" his "morality upon others." Cuomo, who was appointed by Carey to be the Secretary of State of the State of New York in January of 1975, used this line repeatedly when he ran unsuccessfully for the Democrat Party nomination for the Mayoralty of the City of New York in 1977 and when he ran in the general election that year as the nominee of the Liberal Party of the State of New York against the pro-abortion Democrat nominee, then United States Representative Edward Irving Koch, and the Republican Party nominee, the pro-abortion New York State Senator Roy Goodman, and the Conservative Party nominee, radio talk show host Barry Farber. Andrew Mark Cuomo, then twenty years of age and a student at Fordham University in the Borough of the Bronx, was long suspected by the Koch campaign as having been the one responsible for the hiring of vans with loudspeakers that blared "Vote for Cuomo, Not for the Homo" message as they drove through the streets of the Borough of Queens, although Figlio di Sfachim has always denied any involvement in this effort. Following Koch’s death in Manhattan early Friday, the New York Times released a 2007 interview during which Koch said he never truly forgave Cuomo, or his son Andrew, now New York’s governor, for the dirty political trick. Defeated by Koch in the general election for Mayor of the City of New York in 1977, Mario Matthew Cuomo won the Democrat Party nomination for lieutenant governor in 1978 (then Lieutenant Governor Krupsak, also a pro-abortion Catholic, challenged her pro-abortion Catholic Governor, Hugh Carey, unsuccessfully in a primary that year), and was Carey's heir apparent in 1982 when the latter chose not to seek a third term. Cuomo termed the tables on his old adversary Koch, defeating him in hard fought primary in 1982 for the Democrat Party's gubernatorial nomination, going on to defeat Rite Aid magnate Lew Lehrman, the nominee of the Republican and Conservative parties, and the Right to Life Party nominee, Robert Bohnar. Cuomo loudly defended "abortion rights" during that 1982 general election campaign, and was known to telephone priests in various conciliar parishes if he got wind of any criticism uttered about him from pulpits during sermons. Cuomo's support for "abortion rights" came to the national forefront in 1984 after the conciliar "bishop" of Scranton, John Joseph O'Connor, was appointed to be the conciliar "archbishop" of New York. Even before his "installation" at Saint Patrick's Cathedral on Monday, March 19, 1984, O'Connor told longtime WNBC-TV newsman Gabe Pressman that he, O'Connor, "was sick and tired" of politicians who say that they are "personally opposed" to abortion while supporting a nonexistent "right" of a woman to choose to kill her preborn baby. Mario Matthew Cuomo was never excommunicated by the conciliar officials. Neither has Figlio di Sfachim, who was elected on November 2, 2010, to become sixth consecutive pro-abortion governor of the abortion capital of the United States of America, the State of New York. Five of those six governors (Hugh Leo Carey, Mario Matthew Cuomo, George Elmer Pataki, David Paterson, and and Andrew Mark Cuomo) have been "Catholics" who have to this day maintained their good standing in the counterfeit church of conciliarism. The sixth, the disgraced, notorious opportunist named Elliot Spitzer, was a Talmudist who made headlines for himself as Attorney General of the State of New York while harassing and threatening to prosecute crisis pregnancy centers even though he was only plowing the ground that had been plowed before him two decades earlier by that reprobate of a human being named Robert Abrams. The now retired universal public face of apostasy, Joseph Ratzinger/Benedict XVI, was not so "tolerant" and "patient" when His Excellency Bishop Richard Williamson after the latter made were considered to be "offensive" comments about the nature and the extent of the crimes committed by agents of Adolph Hitler's Third Reich that Ratzinger/Benedict required a "rethinking" of the relationship of what he thinks is the Catholic Church with the "faith of Israel." Ratzinger/Benedict even went so far as to have his minions exercise their influence with the government of Federal Republic of Germany to reinstate Bishop Williamson's conviction for a "hate crime" after it had been overturned. One cannot offend the Talmudists. One cannot dissent from apostate, blasphemous agenda of the conciliar revolutionaries. One can, however, support sins that cry out to Heaven for vengeance and remain in perfectly good standing with the conciliar officials, who pat themselves on the back for being so "patient" with them, explaining to the Catholics in the pews who are stupid enough to contribute their money in support of doctrinally, liturgically and morally corrupt men, many of whom grow physically fat and lead the most comfortable and luxurious of lives, doing all this while waxing with great sanctimony about how they believe that "dialogue" will help to convince men such as the Cuomos to come to oppose the daily slaughter of the innocent preborn in the name of "human dignity" and not, it should be noted, because it is opposed to the binding precepts of the Fifth Commandment. Archbishop Dolan was in Albany to lobby on behalf of Catholic schools, which face increasing financial strain because of unfunded government mandates. In Milwaukee, Archbishop Jerome Listecki said that he, too, would be averse to the idea of denying the Eucharist to a prominent abortion advocate, although he did exclude the possibility. The newly installed archbishop told an audience at the Milwaukee Press Club that his decision would take into account "the impact of whatever that person is doing." Before taking disciplinary action, he said, he would want to "help them come to an understanding of the teaching." Consider, if only for a moment, the fact that we are now just two days away from the forty-first anniversary of the Supreme Court decisions in the cases of Roe v. Wade and Doe v. Bolton. The time for "persuasion" has long since past. Alas, sanctions in the counterfeit church of conciliarism are reserved principally, although not exclusively, for those who dare to reject its multiple apostasies, most especially upon presbyters who dare to leave the conciliar structures as they reject the nonexistent "legitimacy" of Joseph Ratzinger as "Pope" Benedict XVI, and also upon those who dare to utter any word that offends the sensibilities of the conciliar church's "elder brothers in the faith." Persuasion? I suppose it's easier to convince oneself of this empty canard than to run the risk of daily ridicule in the secular media. Note also the language used by "Archbishop" Jerome Listecki. He referred to those who support the slaughter of the preborn under cover of the civil law as "pro-choice," not "pro-death" or "pro-abortion." Using the devil's language is not in the service of truth. Yet it is that many conciliar "bishops" and presbyters use the language of the pro-death lobby. "Archbishop" Timothy Dolan is said to be very "pro-life" even though he goes to fully pro-abortion "reform" Talmudic synagogues. This is, in and of itself, quite a statement as each Catholic, whether a bishop or a priest or a consecrated religious or a layman, is supposed to oppose anything that is repugnant to the binding precepts of the Divine Positive Law and the Natural Law. One is either a Catholic or he is not. Period. Timothy Michael Dolan, a conciliar revolutionary, is not a Catholic. Timothy Dolan's fear of making "martyrs" out of pro-death Catholics in public life by refusing them what purports to be Holy Communion is entirely misplaced. He believes that he is a Catholic bishop (he is neither a bishop or a priest). He believes that Our Lord comes down on Novus Ordo tables. He has an obligation to defend the integrity of what believes to be the Most Blessed Sacrament no matter who is made out to be "martyr" by the secular media or by other dissenting Catholics. Saint Tarsicius laid down his very life to protect the Blessed Sacrament that he was carrying on his person. Shouldn't this inspire man who believes himself to be a Catholic bishop want to do the same? That Timothy Dolan believes it is "prudent" to keep giving what he thinks is Holy Communion to pro-abortion Catholics is just another sign of the era of apostasy that is upon us, and Dolan's policy is that of the ever "merciful" Jorge Mario Bergoglio, who is not, of course, very "merciful" to the Franciscan Friars of the Immaculate. Then again, this is the same Timothy Michael Dolan who welcomed Figlio di Sfachim and his own paramour, Sandra Lee, at the Alfred Emanuel Smith Memorial Foundation Dinner on Thursday, October 18, 2012, the Feast of Saint Luke the Evangelist, as he, Dolan, yukked it up with the pro-abortion Barack Hussein Obama/Barry Soetoro and the partly pro-abortion/partly pro-life Mormon named Willard Mitt Romney. Perhaps the greatest offense of the entire offensive evening fifteen months ago was precisely the fact the fact that this pro-abortion, pro-perversity Governor of the State of New York, who had promoted and then signed the so-called "gay marriage" law passed by the New York State Legislature in 2011, was permitted to attend the dinner at all and was placed in an honored seat next to the "archbishop emeritus" of New York, Edward "Cardinal" Egan, while he, Figlio di Sfachim, a divorced man without even the fig leaf of a conciliar decree of nullity, was permitted to bring his concubine, who sat to his left and was clearly visible in her completely immodest attire to the right of every speaker shown during the thirty-nine video of the event (see Alfred E. Smith Memorial Dinner). 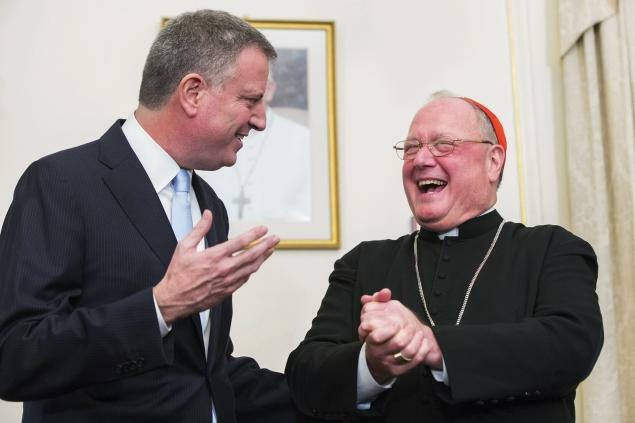 Mayor de Blasio met with Cardinal Dolan Monday -- and the pair vowed to team up to try to bring Pope Francis to New York. “We have a common passion and a common wish,” de Blasio said after meeting with Dolan at the cardinal’s residence, their first get-together since the mayor took office. “We hope that some day Pope Francis will visit our city, which will be an extraordinary blessing for the people of New York. Speriamo!” said Dolan, Italian for “We hope!” before the men bantered for a few seconds in the language. Although the new mayor and the cardinal have some major policy disagreements, de Blasio emphasized their agreement on his signature issue -- bridging the divide between the haves and have nots. "We share common ground on the fundamental issue of fighting inequality and trying to help those in need, and I think this is going to be a tremendous working relationship," de Blasio said. On that point, de Blasio also declared the Pope a kindred spirit. “He’s the most powerful voice on this earth on how we have to address inequality all over the world, and on the dangers of letting inequality grow,” de Blasio said. Dolan said the topic of personal faith didn’t come up in the meeting, but that he’d be open to shepherding de Blasio back to the church if the chance ever arose. “If the mayor ever wanted to talk to me about his faith and religion, I’m a pastor first,” Dolan said. De Blasio was baptized Catholic but does not practice any organized faith. Yes, Jorge Mario Bergoglio is welcome to visit in the baby-execution capital of the United States of America, the City of New York, as Warren Wilhelm, Jr.,who goes by his mother's maiden name and by the first name of "Bill" (which means that I could be "Dr. Thomas Red Fox," the grandson by adoption of a purported Sioux Indian chieftain; imagine the grant monies I could have raked in with that kind of charade? ), knows that Jorge will not be speaking about the chemical and surgical execution of preborn babies if he ever visits the City of New York as "Pope Francis." He's the sort of "Catholic" who is welcome in my native state, not those of us who try to adhere, despite our own sins and failings and bad examples, to the truths of the Catholic Faith and to defend them as Christ the King sends us the graces through the loving hands of His Most Blessed Mother to do so. Believe me, I made the Cuomos' "get out of New York" list twenty-eight years ago now when I ran for lieutenant governor on the Right to Life Party line with the late District Attorney of the County of Nassau, New York, Denis E. Dillon. And I am more than happy to oblige Figlio di Sfachim as I have no intention of returning to the State of New York ever again, and anyone who knows me knows how attached I have been to Long Island. No more, though. No more. We have not here a permanent dwelling. Figlio di Sfachim got elected with the support of a lot of supposedly "pro-life" Catholics in the State of New York four years ago. He will probably be re-elected with the support of a lot of supposedly "pro-life" Catholics in the State of New York this year as the little low life is entirely correct when discussing the fact that careerist Republicans want the "moral issues" to go away entirely. He, Cuomo the Lesser, is happy to see the organized crime family of the false opposite of the naturalist right implode as he knows that voters will always choose a real, honest-to-goodness Democrat pro-abort, pro-perversity statist over a "wanna be" Democrat pro-abort, perversity statist nominated by the Republican Party. After all, why settle for the imitation when you can have the original? The conciliar revolutionaries are entirely responsible for this state of affairs, and they have no intention whatsoever of doing anything to oppose the militant pro-abort, pro-perversity statist named Andrew Mark Cuomo or Warren Wilhelm, Jr./Bill de Blasio, who is as concerned about "income inequality" as Jorge Mario Bergoglio, who has told Catholics not to be "obsessed" about abortion and "gay marriage" and who has effectively told "restorationists" and "triumphalists" to get out of what he thinks is the Catholic Church. There is even going to come a time, my friends, when Barack Hussein Obama/Barry Soetoro or some caesar or caesarette after him is going to say "right-to-life, "anti-gay" citizens are not welcome anywhere in the United States of America. It will be at that time, my friends, when those who have not as yet come to realize that the counterfeit church of conciliarism is false or that its "popes" have been illegitimate claimants to the Throne of Saint Peter will see that their "pope" will be at one with the caesars in demanding our imprisonment or exile or even death itself. The martyrdom of the saints we have commemorated in the past few days (Saint Prisca on Saturday, Saints Marius and his Companions yesterday, Saints Fabian and Sebastian today, Saint Agnes tomorrow) may come upon us sooner than we think. We are marked. As the saying goes, "we do not blend." Do not fret. This could be the path that some of us terrible sinners save our souls! May Our Lady send us the graces we would need at that time to remain firm in the proclamations of Viva Cristo Rey!, Viva La Virgen de Guadalupe! We must also remain firm in our complete and total rejection of everything to do with conciliarism. We can make no compromises with evil. Modernity and Modernism both are constructed from the diabolical formulae of Protestantism and Judeo-Masonry. While it is indeed despicable for the likes of Andrew Mark Cuomo and others in the "leftist" camp of naturalism to speak and act as they do, it is more reprehensible that men who are seen by the world to represent the Catholic Church remain silent as they do so. "Nothing that we see here will escape it." Not even the "glories" of the naturalistic, anti-Incarnational and semi-Pelagian United States of America. We can advance the cause of the Social Reign of Christ the King now by refusing to participate in farce and by refusing to be silent about grave offenses to Him and to the souls for whom He shed every single drop of His Most Precious Blood on the wood of the Holy Cross, or we can answer to Him as Our King and Judge at the moment of our Particular Judgments for our belief that naturalism can be retarded by naturalism rather than by Catholicism and It alone. We need to ask Our Lady of the Rosary to have mercy upon us as we try to fulfill her Fatima Message by making reparation for our sins and those of the whole world, praying our Rosaries and offering our prayers and penances and sufferings and mortifications and almsgiving to the Most Sacred Heart of Jesus through the Sorrowful and Immaculate Heart of Mary. Let us work in behalf of the governor of the human race, Christ the King, no matter who calumniates us in the process. Every Rosary we pray, each moment we spend before Our Lord's Real Presence in the Most Blessed Sacrament, every offering we make to the Sacred Heart of Jesus through the Immaculate Heart of Mary can do far more for the good of souls and of our nation than all of the concerted, insane and absurd effort to make naturalism bear fruit against itself.